Milopita is the Greek word for apple pie and this Greek “milopita” is made with “epsima”, a concentrated grape syrup, which gives it its unique taste. I made this “Milopita” (apple pie) last week. I managed to take a couple of photos when I reversed it from the baking tin just in time to catch the last light and was expecting to take more photos the following day. The next morning I had a planned appointment with a dentist who was recommended by some friends. There was a problem with one of my teeth which dates back several years. This tooth has been giving me pain and the last time, just before relocating to Nafplion, I had to do root canal treatment which lasted a couple of months. I was hoping that my troubles were over but at times I felt a pain just touching my cheek or a sharp pain when chewing. I patiently waited for my next visit to Athens to go to the doctor who made the treatment but I couldn’t wait any longer. The new doctor took an x-ray which showed that there was no way the tooth could be saved plus there was an infection which could create more problems to my health. He said that the tooth had to be extracted and I could take a second opinion if I wanted. However, as I had recently heard of an incident, where a woman, a friend of some one I know, is now waiting for a heart transplant because of a tooth infection. That alone was enough to make me take the decision immediately. The tooth was extracted, cleaned and sewed with 5 – 6 stiches. I started antiobotics immediately and will continue until Tuesday and hopefully on Wednesday will have the stiches cut. My cheek was swallen and still is a little bit. The first and second day were painful and I had to eat only soft food. During the first two days my jaws could hardly open. Friends came over to visit and my “milopita” was enjoyed by them. I was in no mood either to eat any or to take photographs but I did reserve a small piece which I used to take some photographs and ate it later on to have an opinion. You may be wondering why I am calling this Apple Pie Greek. This apple pie is my own creation as I wanted to use a unique Greek product called “epsima” in Cyprus and “petimezi” in Greece. It is described as “grape molasses” in other European or Middle Eastern countries but to be frank I have never tried “grape molasses” in order to be able to compare if it is of the same consistency and taste of that produced in Greece and Cyprus, which is grape juice which is boiled until it is reduced to a thick syrup. This time of the year grapes are mature and sweet and the “must” (juice of grapes) of black grapes is boiled, usually with lye (made by wood ashes), called “alysiva” in Greek, which purifies the must. Foam forms on top which is removed by a slotted laddle until no more comes out. This is a procedure I’ve witnessed when my mother used to make “palouzes” by using either ashes or a soil with alkaline properties. It was just called “asprohoma”, meaning white soil. However, this is a subject I must refer to in another post. When the “must” is cleaned and filtered, it is further boiled until it concentrates into a sweet syrup. This time of the year you can buy “petimezi” in all farmers’ markets. In Nafplion you can find it almost year round because it’s a product produced locally and it can be preserved for many years. For us locals it’s rather expensive taking into consideration that you need around five kilos of grapes to take 8 cups of grape juice. After boiling procedure it concentrates into almost a cup of “petimezi”. It’s much cheaper than what I’ve seen sold in other countries. We buy it around 7 Euros for 500 ml. If you are interested in buying some you can contact me. This syrup has been known since antiquity. In fact in ancient Greece there were four types, depending on the time of boiling and consequent density. The first type was called “glefkos” and was made from ripe grapes into “moustos” (must). The second type was called “epsima”, which in Cyprus has retained its ancient name until today, whereas in Greece it is known by its Turkish name “petimezi”. This is proof of many Greek products which lost their original name in the course of millennia, including 400 years of Ottoman ruling. This was of the consistency like thick olive oil. The third type was called “epsetos” and was thinner than “epsima”. The fourth was called “siraeon” and was another type of concentrate grape juice produced from “siraeon” wine. Before sugar was imported to Europe, this was one of the main ingredients together with honey, carobs, figs and pomegranates where syrup was extracted to make syrup and were used as sweeteners. Petimezi has a sweet and sour taste. Normally I would have added honey to balance its sourness but unfortunately I run out of honey so I opted to use cane sugar instead. The flavour of “petimezi – epsima” is amazing but also healthful, as it contains antioxidants, vitamins and is rich in iron and calcium. Together with Greek velvety yoghurt I think it is rightfully named as Greek Milopita. The taste of the “milopita” is amazing as during baking the syrup caramelizes, so you can distinctly taste caramel mixed with cinnamon. An amazing combination! I am sending this recipe to European Community Culinary ABC, created byTrattoria Muvara and hosted by Haalo from Cook Anything at Least Once. This month the letter “M” representing “Moussakas”, is represented by my country Cyprus. Cypriot cuisine is shaped by the island’s Mediterranean climate, geography, and history. The majority of its recipes are based on Greek cuisine and the Mediterranean Diet, which is one of the healthiest in the world, using fresh, wholesome ingredients. Cypriots are Orthodox by religion and for Orthodox faithful almost half of the year is fasting period. Meat, including fish with backbones and all the animal products, are not permitted, so our “nistisima”, as they are called, are all vegan. The only exceptions are all mollusks, like calamari, octopus, shrimps, mussels, etc., as well as honey, gelatin and fish roe, which are allowed during fasting. Cyprus’s strategic location in the Eastern Mediterranean, situated between the crossroads of three continents, had brought to the island many conquerors and thus its cuisine has evolved into an amalgamation of diverse tastes and textures, with an unmistakable mark that makes it undeniably Cypriot. We see influences from the Ottomans and our neighbouring Middle Eastern countries but there are also remnants of French, Italian, and Anglo-Saxon influences stemming from the island’s occupation by the French Lusignans, the Venetians, the Ottomans and the British. However, we cannot ignore the fact that all these conquerors have also learned a lot from the Cypriots as well. The Ottoman occupation detached Cyprus from the direct influence, cultural and economic, of the West. It would be very naive to think that after over three hundred years of rule by the Turkish they did not learn anything from the locals and it would be only natural that Cypriot food would also be known in their Turkish names, as even today a lot of Turkish words and expressions are still used in the Cypriot dialect. Take the zest of the lemon and then fill a bowl with water and add the juice of the lemon. Peel, core and slice the apples into even slices (about 8 slices per apple). Keep them in the water with the lemon juice until ready to use. This will prevent them from oxidizing. Sift the flour and add the salt, cinnamon and baking powder and mix. In the bowl of your electric mixer, or with a hand mixer, beat the butter with epsima – petimezi until smooth. Take three tablespoon of butter and petimezi mixture and spread it on your baking tin. Continue preparing the batter. Add the sugar and beat well on high speed until light and fluffy. Add the eggs, one at a time, mixing well after each addition. Add yoghurt, zest and vanilla and mix until incorporated. At this stage the mixture may look as curdled. Strain the apples and mix with sugar and cinnamon. Arrange the apples on top of the petimezi butter. Pour the batter on the prepared apples and smooth the top. Preheat the oven to 180o C / 350o F. Bake for about an hour or until a toothpick inserted in the middle comes out clean. Remove the cake from the oven and place on a wire rack to cool for about 5 minutes. Pass a knife around the edges of the baking tin. Place a platter on top and invert the cake while it is still warm. Serve warm or cold with a scoop of ice cream. An interesting combination! Very autumnal… This pie must taste wonderful. This looks WONDERFUL! I loved all the info on Epsima. Is it the same stuff that is used to make Soutzioukos? Anna soutzioukos is made by the grape juice after boiling and removing the froth. Yum! 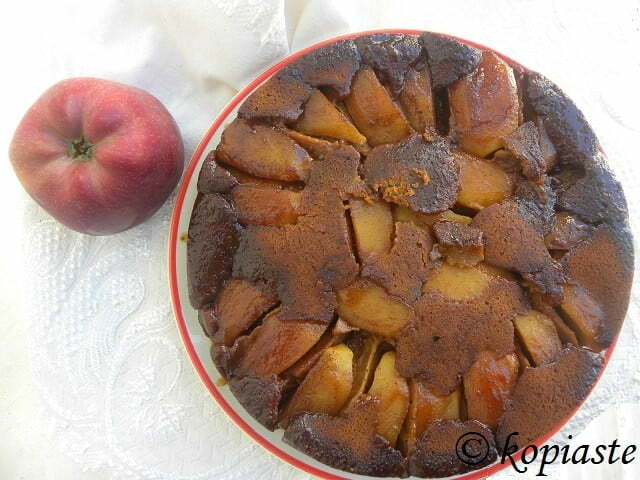 This upside-down apple cake looks awesome Ivy, I love the big chunks of apples. What a delicious cake,Ivy!Love the addition of yogurt! Great Fall dessert! Welcome on board! Thanks for participating to our trip 🙂 The page with all the contributions is online: http://abcincucina.blogspot.com.es/2013/09/m-come-moussaka.html! And now…let’s go in Slovenia!